My first 10 days into EA14 have passed by and I am discovering some issues ranging from nuisances to real distractors … So here is my list of bugs and SO questions. I will update the list as I receive updates from Sparx or other sources. This is a breaking change from EA12.5 leaving all my Deployment Specification Instances unusable in EA14. See the question for more details. Official answer from Sparx: To follow this up, this has been confirmed as an issue and lodged for correction. At this stage we do not know of any work-arounds. According to https://www.sparxsystems.com/enterprise_architect_user_guide/14.0/model_domains/deploymentdiagram.html the “Deployment Diagram Connector Toolbox Icons” should include a “Nesting Connector”. However, when opening a “Deployment Diagramme” the “Nesting Connector” is missing. 1. Create a package with an arbitrary name. 2. Within the package create in the previous step, create a “Deployment Diagramme” with an arbitrary name. 3. Open the “Deployment Diagramme” created in the previous step. 4. Open the Toolbox Icons with “Alt+5”. 5. Go to the “Deployment Relationships” section. 7. The “Nesting Connector” is missing. This happens when you have a high resolution display like my Microsoft Surface Book 2 with a custom DPI scaling of 200%. After today’s upgrade from EA 14.0 1420 to 1421 I am no longer able to use the Deployment Connector when trying to deploy an artifact to an execution environment (or any other node type). 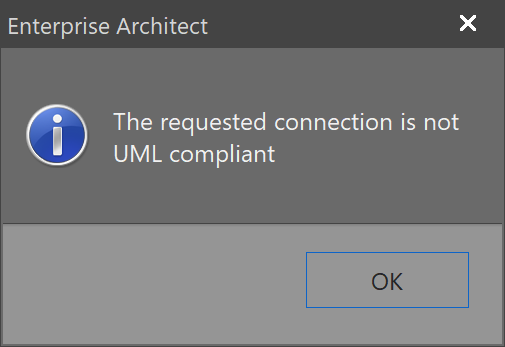 However, the requested connectio actually is valid UML, according to UML v2.51 section 19.2. This differs from the behaviour in v1420, where it was possible to connect an Artifact and an Execution Environment with a Deployment Connector. 1. Create a Deployment Diagramme with an arbitrary name. 3. Create am element of type Execution Environment with an arbitrary name and place it on the open diagramme. 4. Create an Artifact with an arbitrary name and place it on the open diagramme. 5. Use the Toolbox and try to create a Deployment connector connecting from the Artifact to the execution environment. 6. You get a pop up letting you choose from a list of possible connectors: Communication Path, Abstraction, Dependency, Information Flow, Realization, Usage, Trace. The connector “Deployment” is not on the list. According documentation, attributes from a realized interface can be made visible on the class that realizes the interface by showing inherited attributes. However this does not work. The inherited attributes from the interface don’t show up. According to UML v2.5.1 section 19.2 Deployments artifacts can be deployed to execution environment instances. However package validation emits an error stating that this type of deployment is not valid. 1. 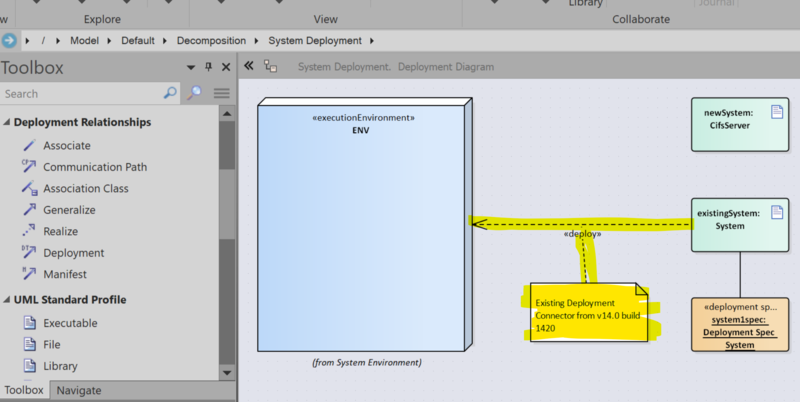 Create a deployment diagram named “Deployment to Execution Environment”. 2. Create an execution environment named “Execution Environment” and drop it onto the diagram. 3. Create an instance of “Execution Environment” named “Instance Execution Environment” and drop it onto the diagram. 4. Create a Component named “Component” and drop it onto the diagram. 5. Create an instance of “Component” named “Component Instance” and drop it onto the diagram. 6. Create an artifact of “Component” named “Artifact” and drop it onto the diagram. 7. 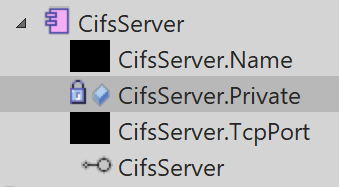 Create an artifact of “Component Instance” named “Artifact Instance” and drop it onto the diagram. 8. Create “Deployment Connectors” from the components and artifacts and connect them with both execution environments. 9. Run Package Validation and notice the errors that are generated.